Gaining knowledge and being educated is the only way things in the world ever change. It is the same with our food and drink. The more you know about it, the more likely you are to step back and appreciate the product you have in front of you and the journey it has been on to end up there. That is why we dedicate so much of our time to teaching people about farming and food and giving them an opportunity to ask questions and consequently, go onto to make small, positive changes in their shopping behaviours. Farming is changing and we want the public to know how and why. One of the ways in which we try and challenge this issue and tackle the subject of food and farm education, is by taking our campers on farm tours. We take them on our farm trail, through a field that backs onto a neighbouring farm, through the chicken fields and into one of our chicken sheds. The tour ends with them being able to pick their own Organic eggs in one of our 6,000 bird barns to take home with them. 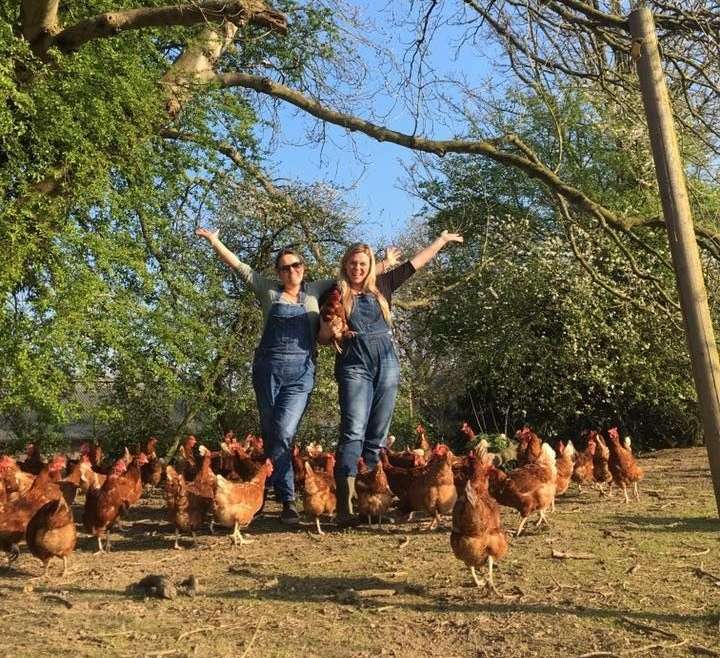 We have done this throughout the summer and are jumping for joy because it is becoming clear that people are genuinely interested in where their food comes from! We always welcome any questions that pop into their heads and we always answer them truthfully, which is something that we believe should be happening in farming all of the time. Being consumers as well as producers, we like to use social media to ask places like supermarkets and restaurants where our food is coming from. We want farming to be open and honest and equip consumers with the right knowledge so that they can make the best decision for themselves and their families. If we do not ask then we will never know, and if people never know then it is unlikely that things are going to change. Read your food labels, get in touch with your local food producers and make sure you keep on asking questions- why don’t you come and stay on our working farm next summer and experience the place for yourselves? Hi. I’m interested in the welfare of the birds once they are no longer productive- what happens at that point? Just saw your section on rehoming – well done you guys!! My question is answered. Might seem a funny question but here goes! Can I ask what you do with your male chicks? I ask as I have a vegan son who still loves eggs however the reason he eats only ones from a trusted friend is that apparently most dispise of them by chucking into a grinder while still alive (shudder). I would love to be able to source great eggs for him when he visits me in Sussex that are humanely produced. Hi Lynn, Thank you so much for your question. No question is a funny question! We always encourage people to ask any question they wish and always answer honestly- we actually get questions about the male chicks a lot. In regards to male chicks, we never have any males on site and do not have any contact with them. In this country, male chicks are humanely gassed after they are hatched. They are not put in to a grinder. I know that there have been videos of this circulated around the internet but that does not happen in this country. After the male chicks are gassed, they are then used to feed reptiles and zoo animals. Some very small producers may keep a few cockerels, but in all honesty you would never find any one who keeps 50% male and 50% female chickens together as the fighting would be terrible and the welfare of the chickens would then be awful. There is talk of a new technique whereby the eggs are sexed before they are hatched. Which in principal sounds like a step forward however then you have to consider what would be used to feed all of the zoo animals and reptiles. The truth is it would just cause a rise in mouse or rat breeding. It is a difficult one to answer, but as farmers we just try to do our very best. For us, it is about providing the information to consumers and for them to then make the decision that is right for them. With education comes change, but it can sometimes be painfully slow and people have little appreciation of how what they put in their shopping baskets affects an animals welfare. We have been asked many times why we farm, when we struggle with what happens in some areas. Our answer to that is that we would much rather me be farming and caring as much as we care, rather than the farm go to somebody who will not care quite so much. Also if this country does not produce food with the highest standards in the world, it will be just imported from abroad and no one will know how those animals have been kept of what they have been fed. It is a difficult thing to solve but asking questions is the only way forward.